Graça Machel's letter to Winnie Madikizela-Mandela - SABC News - Breaking news, special reports, world, business, sport coverage of all South African current events. Africa's news leader. Graça Machel has written a letter to the late Winnie Madikizela- Mandela after her passing on Monday, 2 April 2018. 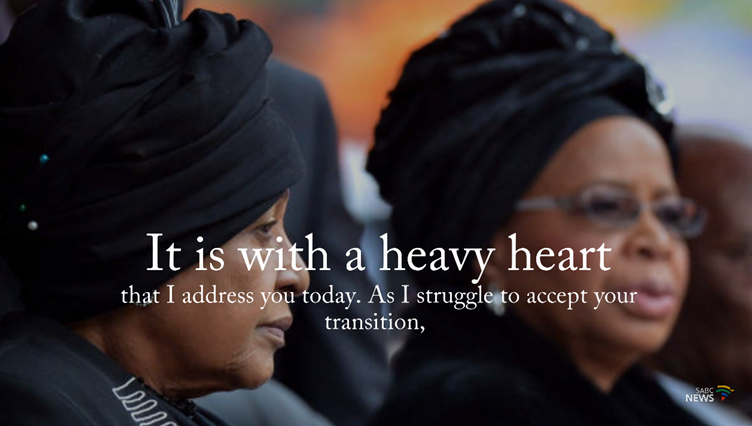 Graça Machel, former President Nelson Mandela’s widow, wrote a heart-warming open letter to the late Winnie Madikizela-Mandela, whom she refers to as her ‘big sister’. 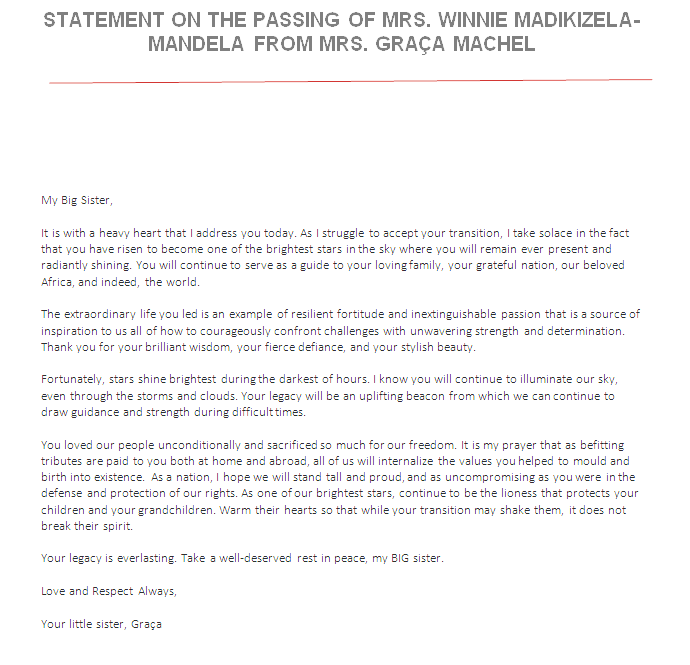 In her letter, Machel pays tribute to Madikizela-Mandela, referring to her life as “extraordinary”. Machel notes how she is struggling to accept Madikizela-Mandela’s passing. “It is with a heavy heart that I address you today. As I struggle to accept your transition,” notes Machel. Madikizela-Mandela passed away on Monday, 2 April 2018. She was married to Nelson Mandela from 1958 till 1996. She was his second wife. Mandela’s first marriage was to Evelyn Mase from 1944 till 1958. Mandela married Graça Machel on his 80th birthday in 1998 in a civil ceremony in Johannesburg. They were married until his death in 2013. Machel signed the letter referring to herself as “Your little sister’.